Questioning is an activity that checks and renews our spirit. In order to come up with powerful solutions, we have to ask powerful questions. The questioning attitude presumes an attitude of openness—that we don’t know it all and we’re open to new dimensions of learning, experiences, and information. Questioning invites the creative process. It starts with not knowing and creates answers out of the void or nothingness. With this notion in mind I will post a question each week and encourage you to live in that question, to discover what the dream activist in you replies! So, plan on asking yourself this week’s question, and any others that come to mind. I also highly recommend writing in your journal, as new insights come to you, and also talk to other dreamers about what you are learning and discovering. One of my favorite quotes is: “Twenty years from now you will be more disappointed by the things that you didn’t do than by the ones you did do. So throw off the bowlines. Sail away from the safe harbor. Catch the trade winds in your sails. Explore. Dream. Discover.”~ Mark Twain~ Let’s Sail! 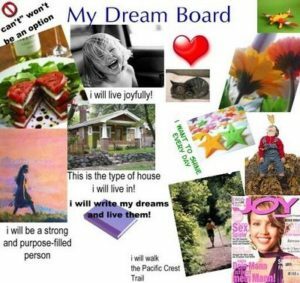 PUT YOUR WISHES, HOPES, AND DREAMS INTO PICTURES…Take time to create a Dream Board—a symbolic visual representation of all your wishes, hopes, and dreams. What is the greatest achievement I can imagine myself accomplishing? What unique contribution do I want to make to the world? As I picture myself expressing my unique talents and doing what I love the most, what do I see? Do I have any beliefs that I am allowing to stand in my way of living my dream? What new beliefs will I be embracing now, that replace any old dream-defeating beliefs I identified last week? Do I have any habits that I am allowing to stand in my way of living my dream? What new habits will I be practicing now, that replace any old dream-defeating habits I identified last week? As a dreamer, who has claimed her/his dream, what do I value and why? Do I allow any of the people in my life to stand in my way, of living my dream? What smaller dreams have I reawakened by claiming my biggest dream? This week’s question to ask yourself is: How would my life look if I forgot about being ordinary and declared: I am extraordinary! Which of my problems of today, might become opportunities for learning tomorrow?